My husband and I have just returned from a very last minute, and very awesome, night away in Toronto, Ontario where we declared this to be the start of the summer of Awesome. As of last week, we had zero plans this weekend. We were gearing up for Ignite PopUp this week, and figured we’d be busy putting the last minute touches together. 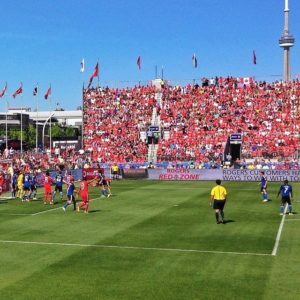 However all that changed this week when someone offered some discounted tickets in the 5th row for a Toronto FC (Football Club) soccer game. With nothing scheduled, we figured, sure why not. On Thursday my husband attended the Tweetstock Conference in Brantford. The conference has bloomed and blossomed over the last 5 years to help people learn how to bring their businesses to the next level using social media and marketing strategies. Despite my jealousy, I was a little excited when he came home to tell me that he won a prize at the conference. 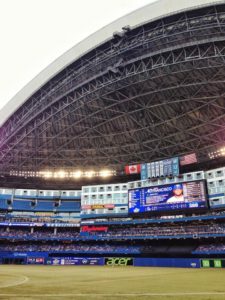 Two 5th row tickets to the see the Toronto Blue Jays on Friday night which also happens to be the big celebration for the 25th anniversary of the Sky Dome! Tickets to some awesome sports teams in the same city on the same weekend. How could we say no? Of course having tickets for Friday and for Saturday made us think “Well why don’t we just stay over for the night?” James talked to his sister who agreed to take Baxter and before we knew it, we were packing up and getting ready to go away for the night. I used travel for work to several locations in Toronto so I had a bit of an understanding for where to stay in order to save some money. And with roads closed or under construction, we were forced to look into alternate forms of transportation or routes to get where we needed to go. We took the subway to the Jays game and amazingly never got lost along the route. 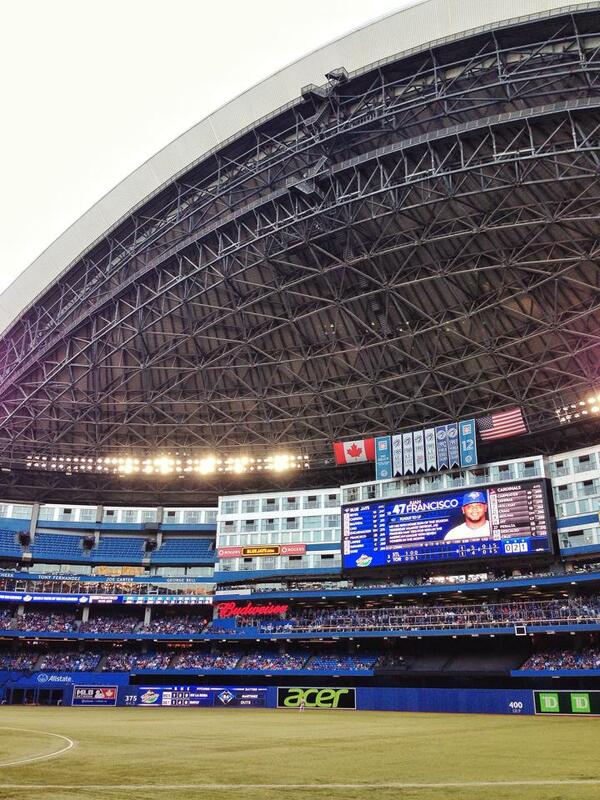 Of course it helped that we followed all those people wearing the blue and white to get to the Sky Dome. Our seats were AMAZING. In fact, once we got to the game we didn’t want to ge up at all. We saw a triple play, a few single player home runs and even a sketchy call where a fan got his glove in the face of an outfielder to prevent him catching a foul ball. There was a buzz in the air and it was electric. Our hotel was nothing really to write home about but served our purpose as a clean place to sleep for the night. In the morning me had a pretty fancy breakfast and then started driving down the Queensway in order to miss all the construction on the Lakeshore and the Gardiner. Why more people don’t use this roadway is beyond me. There are lots of places to shop, two lanes headed in each direction with a turning lane in the centre. It was a perfect route. We even found the Zellers close out store where we proceeded to see all sorts of products on clearance from all the HBC stores. So you can imagine, things were a little over priced compared to what you’d expect at a clearance store. 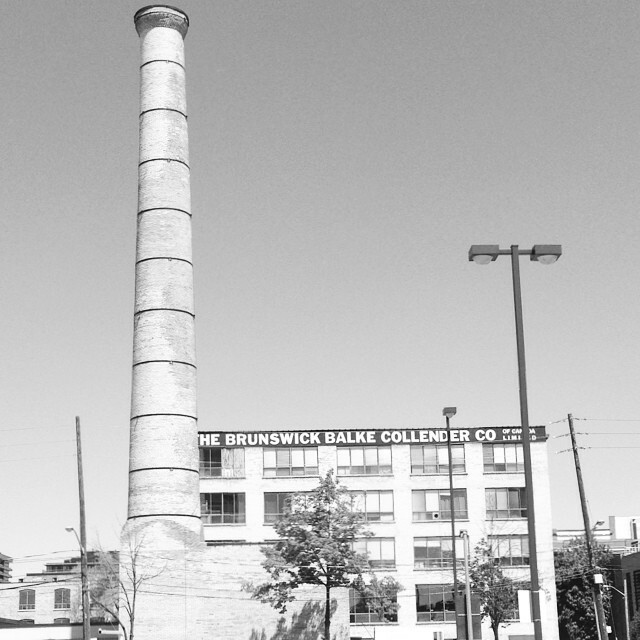 Our goal for Saturday was to spend some time down in Liberty Village. In our research we learned that this area used to be populated by a large number of factories, a prison and a home for wayward women. Liberty Street was known as such as it was where prisoners first tasted freedom after being let out of incarceration. The area now has many converted factories into stores, restaurants and loft apartments. It is the home to the radio station Indie 88 and is just across the tracks from BMO Stadium and Exhibition Place. James is a huge music nerd. It’s true. He likes to know what’s new and upcoming and generally by the time I start to like a song he’s already tired of it. Indie 88 is his kind of station. Because of this, he had hoped to stop in and see if he could talk to them. There were some flaws to this plan. The first being he hadn’t a clue where they were located. The second flaw was he didn’t know if they even allowed random visitors off the street and the third flaw was the entire crew was broadcasting from the Field Trip Festival being held at Fort York. The trip wasn’t for naught however as after walking around for a few blocks and shopping, we looked down the street and saw the scoreboard from the stadium. We were curious. Was it possible to get across? As we wandered down the road, we ran into several groups of people wearing uniforms. We could see the tracks but had no idea how they got across. Turns out – there is a tunnel under the tracks and it would be quite easy for us to use. Jackpot! We also found out that since we were early enough, we could park in a lot right beside the tracks for only $5 a day. A huge savings compared to parking at the stadium. 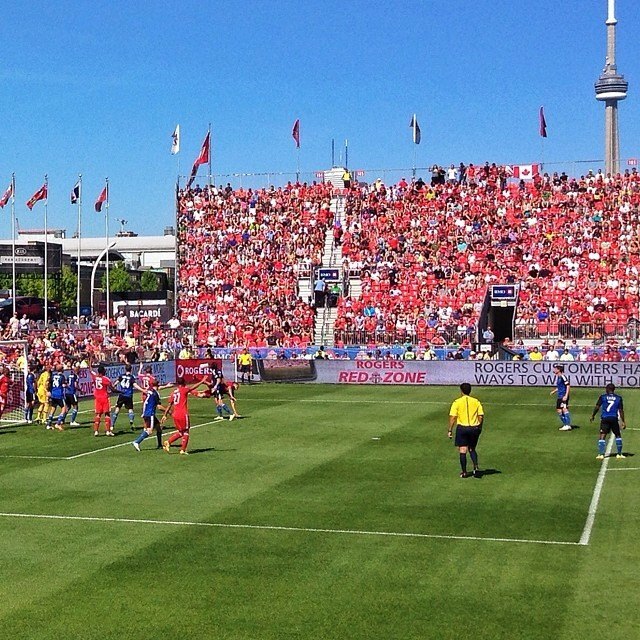 Captured this chop in the box which allowed TFC a penalty shot. Jermaine Defoe netted the ball into the back of the net and the crowd went wild. We moved the car into the lot. Went and grabbed some drinks and some food at a pub we had passed during our walkabout and then made our way to the game. Our seats were just as awesome as the Jays game, I got to have my picture taken with a Luchador, and the hometeam won on a penalty shot. There was some pushing and shoving to keep it interesting as well. All in all it was an awesome night away and I felt completely refreshed and recharged. Both me and the hubby are really looking forward to getting out and enjoying this summer. We have a camping trip with friends planned, a music festival, and a trip for two up to Tobermory, Ontario. We are going to live life to the fullest and continue on with the Summer of Awesome.